Albany most likely will join the ranks of Oregon cities with a stormwater utility fee (or rain tax as I like to call for the sake of brevity), judging by the city council’s reaction to the idea at a work session Monday. The fee or tax would raise money toward the expense of managing the city’s storm drain and piping system and disgorging stormwater to various creeks and the Willamette River. The amount presumably will be established once the city sets a budget and figures out how much it needs and how much it can pass without running the risk of voter revolt. At present, the council was told, Albany pays for what limited work it does on the storm sewers with street and sewer funds and budgets zero dollars just for the drain system. In cities in Albany’s population range (50,000 to100,000) the monthly charge per single-family home currently is as high as $13.61 in Springfield and as low as $5 in Bend, according to tables prepared by the public works department. The council Monday voted 5-0 (Bill Coburn was absent) to direct the public works staff to begin work on preparing a stormwater utility program. It will likely take months to work out the details and run them by the council in work sessions. A council vote to enact the program could come late next year or early in 2017. This is not a new idea, as Public Works Director/Engineering Jeff Blaine pointed out. He had found a 2001 memo by then Public Works Director Floyd Collins, now a council member, urging the council to prepare for a stormwater utility program and fee. Now the issue becomes more urgent because Albany figures it faces expenses for meeting the requirements of a new DEQ stormwater-discharge permit, expected in 2016. 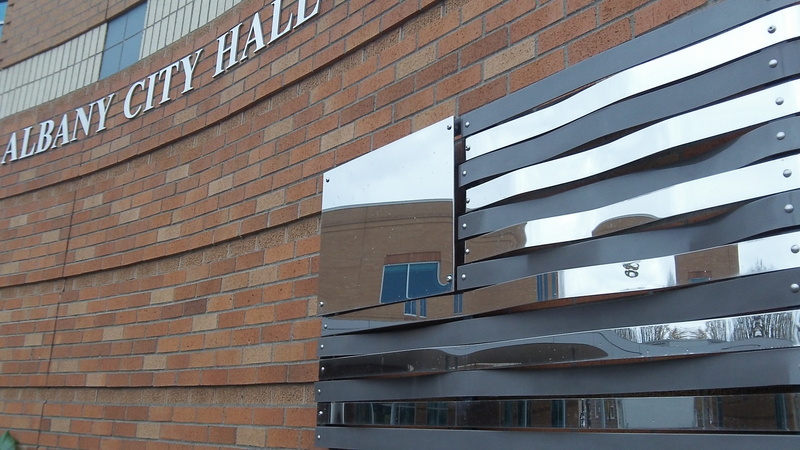 There was talk Monday about providing credits against the fee for homeowners who take steps to lessen the amount of rainwater flowing from their properties into city drains. But Collins believes that with about 20,000 or more single-family lots, all a little different from each other, a system of incentives based on the amount of permeable surface would be a nightmare to administer. We can only hope that when the council puts this new tax into effect, at the same time they develop and allow an acceptable way to collect rain water for use in irrigating a homeowner’s landscape. It would encourage some to disconnect from the city storm water system. You need to read about the case of Gary Harrington in Jackson County who was fined and jailed for collecting government-owned raindrops in three ponds on his property. Scary. General Government and Education Taxes (exclusive of bonds) should be capped at 5% of income, as determined by Oregon tax forms, before any deductions. Income for all adults over the age of 25 who live in the house for more than 6 months of the year shall be included in the calculation. For rental properties, taxes shall be capped at 10% of rental income. Example 1: Working married couple earn $90,000 before deductions. Tax on the property (exclusive of bonds) is assessed at $3500. 5% of $90,000 is $4500, which is above the assessed tax.. Couple pays full tax of $3500. Example 2: Retired, widowed woman has social security and pension income of $45,000, before deductions. Tax on property is assessed at $3500. 5% of $45,000 is $2,250, which is lesser than the assessed tax. Retiree pays %2,250. Example 3: Unmarried homeowner and significant other live in a home with a 27 year old daughter. Homeowner earns $27,000. Significant other earns $30,000. Daughter earns $20,000. Combined income for all three residents is $77,000. 5% of $77,000 is $3850. This is above the assessed tax, so homeowner pays full tax of $3500. As I read your proposal, this would replace Oregon income and property taxes, excepting bonds?? I would not intend it to replace the income tax. That would still exist. It would merely put a cap on the property tax that is based on one’s ability to pay (i.e. their income as reported on their Oregon income tax). The public wants to know what we’re getting for our money, and all I can see is a bunch of nebulous answers and a lighter wallet. What problem does this really solve beyond complying with ever expanding regulations that achieve no purpose! This all but a done deal, providing “make work” for city staff as they implement their plans. How much would you like to bet that Albany’s “plan” will be a near carbon copy of what Salem has done? Count on it. Looks to me like this is just the latest new excuse to feed the EPA/DEQ monster, via the City of Albany. “Soft tyranny” in action. It never ends. It only grows. Albany payers should expect the same. The cost of stormwater service is currently built into the sewer rate and SDC. When the city separates the rain tax from sewer and itemizes both as specific billing amounts, the result should be a lower sewer rate and charge. The net effect of the rain tax should be minimal. This will be a simple rearrangement of the deck chairs with a nominal charge for the overhead cost to administer the federal requirements. Of course, we will not be allowed to vote on this tax. The council will guard that power with every legal weapon in their arsenal. I don’t know whether to laugh or cry at this scenario. Of course, the more likely scenario is that the city won’t lower the sewer rate or charge. Albany residents will experience a double whammy – pay the rain tax AND the existing sewer rate and charge. If that happens then, by all means, let’s have a revolt. Maybe some of our storm drains should be going to wetlands first, sort of like a Talking Waters for rain. A Maryland county offers a rain tax discount if a church starts a preach “green” ministry. 1. Will Albany’s churches pay the rain tax? 2. Will Albany city government bait local churches into preaching “green”? Funny how the council likes to make taxes and tax increases on their own, yet when people wanted to pay 3% of the price of their recreational Cannabis when bought in a safe, licensed local business, half of them plus the mayor refused it.